My adventures in home milling and sifting continue. Most recently, I did fairly extensive additional test milling and sifting of Wheat Montana Bronze Chief hard red spring berries. In the past, I regularly used flour from two main sources: Heartland Mill, and Wheat Montana. Heartland Mill is a good source of hard red and hard white winter wheat flour and berries. 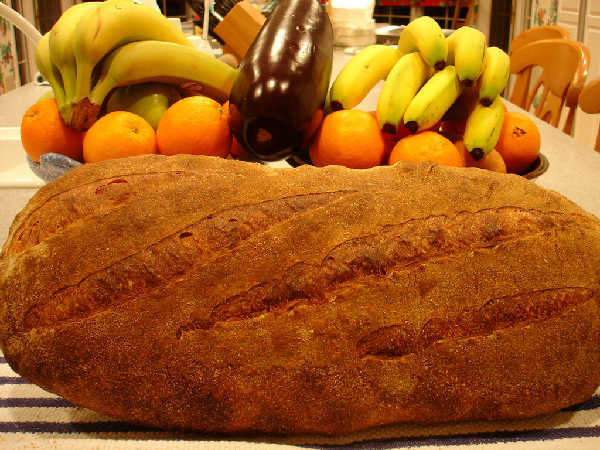 Wheat Montana is a good source of hard red and hard white spring wheat flour and berries. After sending test flours from the milling and sifting session with Wheat Montana Bronze chief hard red spring wheat berries, I wanted to follow that with a "production run" and some test baking. I've already posted a fairly unusual "Reconstituted Mash Bread" made from Wheat Montana hard white and red spring wheat berries. The following is a more ordinary sourdough made from high extraction flour from the same milling session. A spreadsheet in xls and html format is posted with the recipe and the sourdough timing. Additional photos are posted. The formula is again much the same as previous test bakes. It consists of a levain contributing 15% fermented flour to total recipe flour made with equal quantities of sifted rye, sifted spelt, and freshly milled and sifted "cream flour" from my milling session, combined with an overnight soaker of the remaining dough ingredients, which is the remaining "cream flour", 2% salt, about 76.5% water, and 1% malt syrup. The estimated ash content of my "cream flour" is about 1.1%, so it is similar once again to previous high extraction flours that I model after Heartland Mill Golden Buffalo flour. The bread had some large and small holes, as the dough at 76.5% hydration was a little softer than I expected. As before, it takes some experience to learn the amount of water that my home milled and sifted flours will absorb. I slightly overestimated the amount of water in this case and ended up with a bread more reflective of a fairly soft and wet dough. The crumb was light and flavorful, which was expected, since I've had excellent results from Wheat Montana Prairie Gold and Bronze Chief flours in the past. Man, that crumb is fantastic. Thanks. I thought the crumb on this one was darn good, if I do say so myself. It has that soft, cool sourdough crumb you get from a softer, wetter dough. The freshly milled flour has a great flavor and aroma, too. It seems that the "artisan flour" I'm extracting at about 75% yield from these berries works beautifully in this style of bread. I also think the flavor is good, as I've mentioned, using half white wheat and half red wheat in a blend. Overall, I'm very happy about this whole home milling sifting project. The only trouble is it still is taking me quite an effort to mill and sift the typical quantity of 5Kg of wheat berries I needed for the mash bread and this bread, all of which I baked yesterday. I spent several hours milling and sifting day before yesterday. My objective is to get it down to just a couple of hours, but I keep discovering little details that slow me down right now, like leaks in the sifter, subtle feed rate problems, keeping track of the product, keeping the mess level down, and so on. I don't know if it will ever be so smooth and routine that I'll be able to do it really quickly. Pat and I have had some very interesting discussions about scale and hand vs. machine. Pat would probably have a very hard time doing 5 Kg of flour by hand. On the other end of the spectrum, I've acquired a mill and sifter meant to process more like 50 pounds per hour, even more for the sifter. The scale is wrong for doing only 10 pounds or so, of course. The actual milling and sifting goes fairly quickly, but these other problems creep in to my setup having to do with setting up the machines, cleaning them, and keeping track of the product in my process, which has more streams and steps. Bill that bread looks awsome. Do you attribute the great crumb to sifting the flour? I am also using Bronze Chief and Prarie Gold berries. I may try this after reading through all of the information you posted. The flour is around a 1.1% ash content plus or minus, so it is a "high extraction" flour, meaning that it is somewhere right in between a white flour and a whole wheat. The ash content of white flour is about .5% or so, and the ash content of whole wheat flour is more like 1.6% or so. The ash content is highly correlated with the outer seed coat of the berry, so my ash content of 1.1% indicates the flour is sifted to a point right in between. High extraction flour is more or less the type of flour that might have gone into a typical country French sourdough miche, which is the type of bread I like to make. Although I didn't make this one round, it is essentially that type of bread. The sifted high extraction flour is an excellent flour for rustic sourdough loaves, as you can see. I've had good luck with breads made from flour milled and sifted from hard red winter wheat berries from Kansas, as in berries from Heartland Mill, also. So yes, the sifting clearly makes a huge difference to the density, texture, and color, just as mixing half whole wheat with half bread flour would. However, since it's not a "whole grain flour", it is also somewhat less nutritious than whole wheat bread, of course. My answer to that nutritional objection has always been to eat the "leftovers" from my mill as a "cream of leftover wheat" breakfast, which as it turns out is delicious, fiber-rich, vitamin-rich, etc., since it is the "nutritious fibrous part" that I sifted out of the flour that is left over. That way I can have my cake and eat my fiber, too. I don't know if you checked out the mash bread I did from the results of this last milling session blogged just before this entry. That's another way to make whole grain bread that uniquely takes advantage of sifting. The bread is 100% whole grain, and has a soft crumb and a mellow, slightly sweet flavor from the mash. Also you may want to take a look at proth5's (Pat) blog at http://thefreshloaf.com/blog/proth5 if you want to see some discussion of doing this with hand sieves much more practically than I have. I went a little "crazy", as Floyd says, with equipment to mill and sift flour, which is probably way more than anyone presuming themselves sane would want to do. You can check out all that in the previous blog entry links I provided above. I suppose you could call it dedication, but honestly it's more of an obsession. It's great fun most of the time, although I am beginning to feel the tedium building, now that the equipment and the method is mostly figured out. What's left is finding those small changes in the details of my process that will allow the process to flow very smoothly and cleanly with a minimum of wasted energy and hopefully without as much of a mess. I have to admit that if it takes hours and hours every single time without any improvement in sight, I may have to rethink the whole approach. If it does end up taking more like a couple of hours or even three hours per milling and sifting session, then I would say it's going to be well worth it. The ultra-freshness and all that comes with it, the flexibility of types of flour I can generate from just a few grains, and the absence of zillions of little bags of flour on my shelves or in the freezer all the time all are wonderful features of the new approach. I suppose you could call it dedication, but honestly it's more of an obsession. He he... I should say so. I'm imagining myself in your shoes and after about 45 minutes going "You know, I *could* just walk to Safeway and pick up a sack of King Arthur's for $3.50..." and throwing in the towel. Guys with dedication (or obsessions) like you are made of stronger stuff than I am. that is probably the prettiest crumb I've seen in a long time, just beautiful. I wish I had the time to try home milling. It really seems to make all the difference in the whole grain loaves. High 5 for you! Just to clarify, this is not a whole grain bread. I don't want to get in trouble with whole grain enthusiasts who are disheartened and ruffled when a bread with less than the whole grain is mislabeled as 100% whole grain, a point I sympathize with entirely, even if I don't choose to bake or eat whole grain bread 100% of the time myself. I sifted out some of the bran and outer seed coat in my milling/sifting process, so the flour that went into this loaf is an "artisan high extraction flour" that is somewhere between a whole grain flour and a white flour. It could be approximated by mixing store bought white bread flour and whole wheat flour in a 50/50 blend. The other blog entry just before this is a whole grain mash bread. There, I used the separated bran, red granules, dark flour, and white flour to make a simmer, a mash, a soaker, and a levain, which all were combined to get back to 100% whole grain in the bread itself. What can I say...other than you're truely amazing. You give me inspiration. Thanks for the kind words. I'm so pleased you enjoyed the write-up here. I've seen your excellent breads and write-ups and enjoy reading your entries. It's nice to see you've taken up writing instructions for bakers who want to get a good start on some very nice artisan bread recipes. I milled up about a pound of wheat berries this weekend (even though I have a pound of flour aging and even though I have no time) because of the way the bread with home milled tastes. I didn't get a chance to bake it, but will very soon. I would join you in saying that all this insanity has a great payoff in taste. You are right 5 kg of flour would be quite a project for me to grind - although the more often I grind the more able I am to spend long periods at it. But 5kg - that's a lot of work to hand grind! One day I will motorize -or get a "dog treadmill" attachment for the pup who has been eating biscuits made with home cracked wheat - so he can do the work :>)! In the meantime, careful examination of the output of this week's milling has convinced me that - similar to your setup - I need a coarser sieve for the first rough grind whis will allow me to separate the bran more efficiently. So that's a bit more money spent on the hobby - but only a little bit more. But glad to see that you're baking again! This flour certainly performed well. You may find the CII results interesting. My sifted flours tested low in wet gluten content according to the CII tests. I'm not sure how that could be, given that it's the same type of berries as Wheat Montana Bronze Chief and Prairie Gold Flour, both of which showed higher gluten content. So, I'm not sure what to make of that. Also, the farinograph, protein content, and baking results above seem at odds with the wet gluten content being inordinately low. Another strange thing was that the protein content and ash content numbers for the grain itself seemed highly variable. Nonetheless, the basic patterns still emerged much the same. I just found myself doing more passes than I have done with HRW wheat, which I attribute to the harder, higher protein hard red and white spring wheat used for this run. The color of this flour and the resulting crumb was whiter, even though the ash content is probably about the same. I don't know if that mash bread is interesting to you, but it worked out very well. At first, the dough seemed like it might end up being that "gummy mess" that PR refers to if you get a "late enzyme attack". However, it came together after some stretching and folding, and kneading in a little extra flour. The mash flavor and soft crumb are different from a traditional WW sourdough hearth bread. Just printed out your full test results so I can give them the quality thought they deserve. I want to finish some more controlled bakes with my flour for now as the poor man's method of testing my milling consistency - but I was interested in the mash bread. I need to get the PR book, read up on the technique, and get my mind around it. I'm not above doing a pan bread from time to time and this sounds like a technique that would work nicely in a pan bread - maybe enriched. Or maybe grind the bran through the fine setting of the mill and create a soaker to put in an enriched bread. I think it would be fun to capture that taste for applications where I usually use a pain de mie. Right, I like the idea of using some of that flour in bagels. In particular, the earlier and later higher ash and higher protein, darker flours may have some characteristics very similar to first clear flour and might make a lot of sense to add to bagels. I also like the idea of using the same basic flour used to make the bread shown above in sourdough focaccias I like to make. The dough for this bread reminded me of the focaccia dough a little. I'm also picturing making a this flour from a blend of HRS and HRW white wheats. I'm thinking a very good sourdough raisin focaccia might be made with just that flour alone. Another idea would be to add the first and last flours to the bagels, and use the whiter flours from the middle of the milling/sifting process in a focaccia or even as the only flour in a focaccia. I love bagels and have a couple of blog entries back there a ways derived from a great recipe susanfnp posted on TFL. Good luck figuring out the mash bread, if you give it a try. I think it's worth doing once, just because it's so different. I'll probably be making mash bread at least half the time when we are short on whole grain loaves in the freezer. Ah - back when you were just a baker - not a miller! Getting any quantity of "first clear" is a bit of a challenge for me, but I think it might be worth it. I can scale down my bagel formula a bit. I also make levain bagels. I've been boiling in heavily malted water and then giving them a swim in an ice bath. I actually constructed some bagel boards that fit into my oven. 5X16X1 in boards covered with some coarse linen (left over from a sewing project). Used per the instructions in the "Bread, etc" book and inspiration from Norm. I can't really explain the science behind why they matter - but they really do. I've done bagels before, but these (according to my bread tester who hails from New Jersey) "rocked." I could tell the difference (and this with my standard bagel formula and technique - the only change was the boards.) So - gadget master that you are - I can't see why you wouldn't try the boards. - he he. Crazy? - Inspired, I say - inspired. That's my story and I'm sticking to it! I read that section of "Bread" back when I first saw the susanfnp recipe and decided to give bagels a try. I also saw Norm's discussion of the boards recently. I'll have to make a board or two. I haven't made bagels since I got the brick oven up and running, and the bagel boards would be perfect for getting the bagels into the oven properly. You enjoy tempting me with these projects, knowing I'll find them impossible to resist, don't you? I also could stand to make some custom peels that are long and narrow to accomodate the long 1Kg (of flour) loaves I've converged on as a good fit to the oven and produce good sized slices, like the loaf above. My store bought peels are square and too short in one dimension, too long in the other. How in the world did you manage to snag a bread tester from Jersey? At least a tester from NJ might know a good bagel, especially if the tester has been around long enough to make a 25th college reunion along the way. But the boards are really a small thing - mine took me about a half an hour to make from scrap lumber and spare linen, so I'm not feeling guilty about those, because they make a big difference for a small thing. Brick oven bagels should seriously rock. D'oh - you're a Jersey boy. My house sitter and bread taster happens to be a transplant to a mile high from there. I'm also an East Coast transplant, but not from a state with any bagel cred - although I can tell a real hoagie roll when I bite into it. Maybe that should be my next project. Because I need another project :>). As a bit of French bread expert, just because I see it every day, a bread with 1,1% is what we cal a "bis" or a semi-complet. The typical French country bread that you buy these days over here is made of .65 - .80 and is lighter in colour and texture. Your bread would be sold as Pain au levain semi-complet. Have you tried making one just out of ,80 for example? Like I told you in the other post, it is an ash content that I particularly like. today I'm doing the 80 + spelt by means of 400g to 140g. It makes a nice light loaf but not a totally white. I looked at your spread sheet and it is really rather scientific! I admit that I go by the method of throwing a bunch of ingredients in and seeing what comes out. Like I told you already, we don't choose the flour by the wheat type but by the ash. When you feel like experimenting, try 400g of a whiter flour like ,75 (you said you couldn't get lower) plus rye. That makes a very nice country loaf. Otherwise, your bread looks very nice. Maybe I didn't read closely enough, but how do you bake it? What temp? I appreciate your explanations and descriptions. I can get something around an .75% ash content, but the yield is somewhat low, maybe only about 25%. I can certainly make a couple of breads, though. 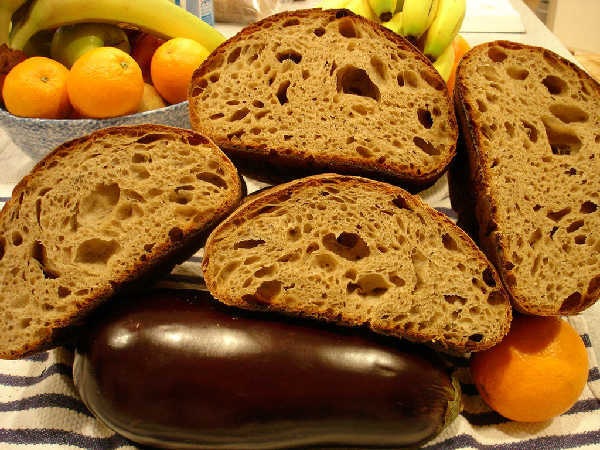 One bread could use the higher ash content flours and be a whole wheat-like bread, the other could be made from the lower ash content flour to be as you suggest. I can also use some store-bought white bread flour or AP flour to create the desired ash content. It would still be far closer to a T80 style of flour doing it that way than by mixing whole grain and white flour, which is the usual suggestion in baking books I've read, if "high extraction" flour is not available. As to why I do it, well, it is fun. Beyond that, as I mentioned it's hard to get customized flours at varying ash contents in retail quantities. This is my way of "going to the mill" to get T80 flour or some other grade, as desired. Instead of having lots of little bags of spoiling or frozen flour, I just mill and sift to order from large buckets of grain I have. The grains last a very long time without freezing if stored in sealed containers. So, it's more work, but it gives me options in the types of flour I can have, the freshness is extraordinary, and the storage of the grains is relatively easy and relatively inexpensive compared to purchased flours. But yes, it's a little crazy, as a few have commented. However, as a hobby, it's just something fun and interesting to pursue. The baking is in my back yard brick oven. The temperature is a little variable, as a result. These loaves, for example, probably went into an oven that was a little too hot. However, in the overall scheme, I end up sometimes using the oven when the temperature may be a little too high or low and adjust the best I can by placement of the bread and so on. The reason for the variation usually has to do with the fact I'm almost always cooking around the bread schedule. So, I might want to sear some meat and make the oven quite hot at first (maybe 600F), then let temperature drop some and bake bread, then braise the meat later at temps down around 350F, and so on. So, the temperature is a little hard to specify exactly. Typically, I would bake this type of bread starting with a hearth temperature around 500F, using retained heat method (no fire in the oven), steaming the chamber, seal the door, then allow the temperature to drop down over the course of the bake to around 425F, opening the door at some point to release the steam. I think this bread above started with the hearth temperature around 530F, so it was too hot, but I had other timing of cooking to consider, so in it went. I don't know why that is. I've wondered if there is a function to flouring the bread, or is it for the appearance? My typical routine has been to brush off the flour on the loaves with a pastry brush before slashing them. When I bake in my back yard brick oven, I spray the loaves with a fine mist, as well as fill the chamber with steam using the same spray mist, then seal the opening of the oven with a wooden door covered with damp towels. So, I guess that explains the appearance. I don't think the loaves would look very good if I sprayed them with flour on them, but maybe that's wrong. Or, I could only spray the chamber and not spray floured loaves. I have not experimented much at all so far with flouring. If you have some details of how you would do the flouring, slashing, and steaming, that would be interesting. I'm curious to know what is the French traditional style for the rustic style loaves you've described, if there is one. Maybe you've already detailed your process in your blog, which I will get to soon. Sorry if I'm missing that right now. I haven't yet visited the google translation links, but I will soon. The bread I made today made me think about your quest for a great sourdough because ut was really yummy with a nice, chewy, holy crumb and a crunchy crust. I'm not very scientific, some come out perfect, some less perfect. I never follow a strict recipe and I change the flour each time. Today was the T80 - spelt T70. When I form the dough, I roll it in flour and sometimes sprinkle like for baguettes. I never spray the dough directly. I preheat the oven to 210°C and when it's hot, I slash the dough, thrown a cup of very hot water in to the bottom of the oven which had a drip tray. It's a very quick movement and it makes a big psshhh sound, I close the door, grab the bread, put it in the oven and leave it. I don't modify the heat. I don't add more steam. This method makes a very nice crust and the colour is lovely, but of course, that is subjective! And it all depends on the type of oven. I'd be curious to see your results if you did the same in your oven. In the program I saw the other day they bake the bread in a huge wood oven and the loaves are floured. The steam is created by bowls that are left inside, the bread is not sprayed. I definitely see your motivation in making your own flour! You can be a lot more creative. Don't worry about visiting my blog! It's really new and there aren't that many breads yet. It does give an idea of what we produce with our flours. Over time it'll become interesting because more and more bloggers are participating and their recipes will be included. But of course, all in French! Sorry I didn't reply sooner. I've had some internet connection problems. I was about to reply yesterday and suddenly no connectivity. I'm also a fan of using some spelt and rye in my breads. Today, I did something with spelt that came out very well. I made sourdough pancakes using a combination of white AP, spelt, and white whole wheat in a ratio of about 2:1:1. Most of the flour was fermented overnight, but I added some white flour along with the rest of the pancake ingredients just before making them. The flavor was very good, and I think the spelt may have been part of it. I've always liked the flavor of levains made with spelt. The rest of the ingredients were milk, eggs, mashed bananas and pears, a little brown sugar, cinnamon, salt, and a dash of baking soda - maple syrup on top. I'll have to give a try to flouring the loaves and not spraying them. I probably would still mist the oven for steam. The air near the ceiling of the oven is so hot that the mist instantly turns to steam. Then sealing the oven off with a towel covered door generates some additional steam. I think it's a good way with my oven. I don't have a choice to keep the temperature constant and have steam, since you can't fire the oven while the chamber is sealed off. As soon as I stop the fire, the oven slowly drops in temperature. It isn't all that dramatic, but over the course of an hour the hearth temperature (a thermocouple is buried about an inch below the floor of the oven) might drop from 500F to 430F or so. I can also control the drop in temperature to be more or less by the way I place the door. There are two position, one that seals the oven and one that allows some air to flow into the oven and out the chimney, which can be used both when the oven is fired or to cause the temperature to drop a little faster. To get a dry constant heat, it works to open the door and fire the oven moderately. In the show I saw about artisanal french sourdough bakers, the place bowls of water in the oven that create constant steam. I really like a BIG steam at the very beginning of the baking, then nothing. It's like the crust seizes and that's enough. But yes, without steam, the crust is ruined! I'll give your pancakes a try. I love sourdough pancakes and ever since the blogosphere here in France has tried them they're addicted! I haven't tried complicated ones before. I have a habit of bread and tea for breakfast. Let me know if you flour your bread and what you thought about it! Now that you mention it, my steaming approach also only allows steam for the early part of the bake. I use an orchid sprayer to fill the oven with steam, then I seal the opening with the wooden damp-towel-covered door, then about 15 minutes later, I remove the wooden door. That causes all the steam to leave the oven in a short time. So, the steaming is only for about 10-20 minutes at the beginning. My oven is more designed for pizza, so it probably isn't ideally shaped for retaining steam, but I know it's moist in there because a lot of steam shoots out the chimney when I remove the wooden door. My understanding is that brick ovens designed for bread fill up with steam naturally if the "retained heat" method is used, the door is sealed, and the oven is full of bread. A lot of steam comes out of the dough while it's baking, if the oven is very full. Although I often put a few loaves in at once - enough to cover most of the oven floor, I still end up misting the oven and using the damp wooden door anyway. I haven't tried to be systematic and compare the crust with different amounts of steam. Maybe some day. I have a similar routine - bread and espresso. However, when visiting with a lot of people, it's fun to do a sourdough pancake breakfast. Family and friends seem to enjoy the different flavor and texture of sourdough pancakes. I think they beat anything you can make with a pancake mix, but then I'm a certified sourdough fanatic. I noticed a comment you made about trying wet starters in some starter experiements. I'm curious if you have any interesting French or personal perspective on wet vs. firm starters? My starter is wet because I like to be able to dip in whenever I'm baking. I keep it on the counter and feed every day. I just published an article about a woman who uses the dough method. She takes a piece of dough from every bread, puts it in the fridge and the refreshes it in the evening before baking bread. So in the morning it's really a liquid starter in my eyes. But I recently took some starter and thickened it up and put it in the fridge. I'm going to make bread with it and the take some dough to compare. Bakeries here in France are in to liquid starter (Eric Kayser for ex) because it gives great results and is way more versatile. The results are always great. If I find my starter is getting tired, I feed it rye or 5 cereal flour and it goes nuts. I don't have a specific flour type starter, usually semi- whole wheat, but whatever I feel like feeding it to make it happy and strong. So, essentially, I don't see any other advantage of a firm starter other than for the "once in a while" baker who finds it easier to take care of a ball of dough than maintain a liquid. Or as in artisinal bakers who use the dough method because it is a simple chain of events. A friend told me that in Poland there are bakers that always leave a part of the bread dough in the kneeding machine (pétrin) because it is the starter and they never clean it so that the wild yeast environment never changes. But for modern home bakers, I think wet is best! I've played with firmer and wetter starters over time, and I don't see much "practical" difference, meaning they can both easily be kept healthy and breads of any type made from them. They all seemed easy to keep healthy, with some variation in the feeding routine. With a little thought, or maybe in my case with a spreadsheet, most any recipe can be converted to use a different storage starter. I know some people get used to using one consistency or another and more or less become attached to that method, but I've managed to get used to using different starter hydrations after a little practice. Although I don't see much practical difference between different starter consistencies, I am curious to understand if there is some flavor difference that motivates bakers to use one consistency over the other. As you say, some famous bakers seem to favor wet starters, and at least one author (Maggie Glezer) is a big proponent of a firm starter. I have not tried maintaining both a very liquid and a very firm starter for months to get them to completely change and become stable in a different consistency (if there is a change), so that I could then do side-by-side bakes of the same bread to see the difference.